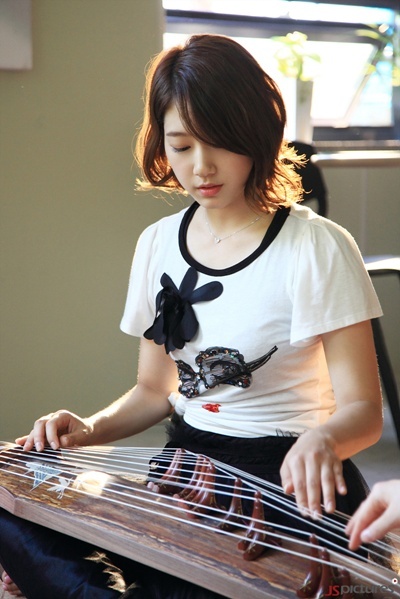 Actress Park Shin Hye is in full swing for gayageum learning and practice. In MBC's new drama 'Heartstrings', Park Shin Hye plays Lee Kyu Won, an art university student and gayageum music prodigy who harbors a passion in traditional music. 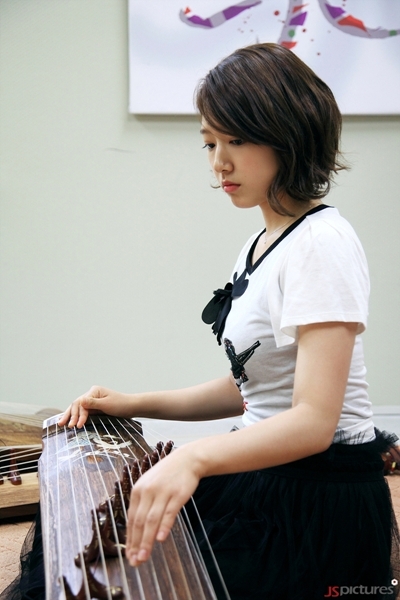 Shortly after being cast, she takes gayageum lessons with university instructors and practices diligently. The repetitive and frequent practices have caused blisters and calluses to grow on her fingertips, but Park Shin Hye says it is ok as she enjoys the learning process. Her enthusiasm has distinguished her as a merit gayageum student. The actress recently transformed into a charming 'campus goddess' with her bobbed hairstyle, clear skin and fresh look. She was praised to be 'prettier than flowers' last week with her candid shot from the filming set. 'Heartstrings' is a drama with an arts university as its background, telling the story of young people who chase their dreams in the aspects of singing, dancing, acting, and arts. It is scheduled to broadcast on June 29. The poster photoshoot took place last week. Awwww, that's our Shin Hye. She's so hardworking!!! I can't wait to watch and listen to her play the gayageum. She looks soooooo pretty!!!!!!!! Shin Hye fighting!! WOW Shin Hye you're so talented and very beautiful i can't wait to watch you're up coming drama......you're so hardworking....i know that you're doing you're best.....smile god loves you...don't forget to pray....i'm you're number one fans....!!!!!!!!!!!!! I always look forward for your upcoming dramas and movies. You've been working hard and done great efforts to hone your craft...strive to be the best of yourself. Not to prove you are good and perfect but work with enthusiasm and enjoy every moment of work. The best inspiration is having the joy in your work. A merry heart is a "healing" to others and a power to overcome all obstacles. As always, YOU ARE LOVED"! I am new to your blogspot. As I keep on browsing, I happened to see where you and your mom were together in one picture. Yes, we'll know the person in how she/he treats her/his family and how he/she values the advices and suggestions of the parents. If,he/she remain stiff-neck and is not open to suggestion, not good for a role model even if how famous you are in the industry! Bless you Shin-Hye! You are both good to look at and Shin Woo getting handsomer. I think you too have the chemistry. Best Wishes to all of you! Yonghwa, PLEASE take care of Shin Hye's heart and show how a real gentleman treats a fine lady like her. KUDOS!